With the increase number of smartphones with different affordable prizes, it’s rare to find someone without using a smartphone. We use smartphone for almost everything, it’s a phone, tv, mp3 player, notepad and what not, we end up using smartphone for every need these days. 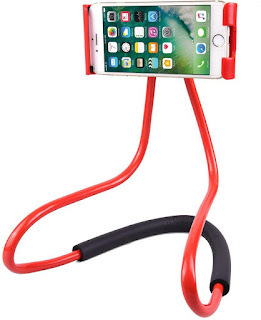 I prefer watching movies in my mobile and I was looking for a multi position phone holder, so that I can make use of it and watch movies hands free. I happened to find this phone holder and ordered it right away because it was what I was actually looking forward to get. 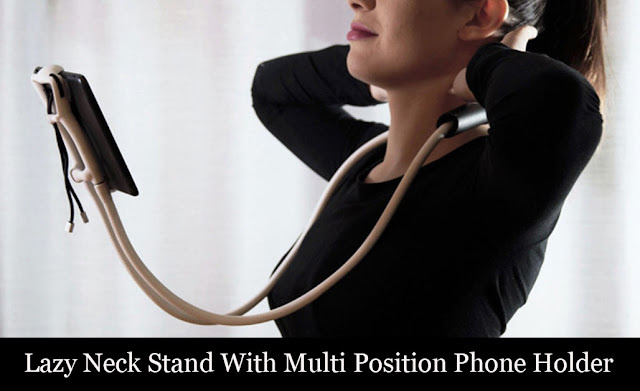 The length of the neck holder is long which helps to support the phone from a distant where we could watch the movies without having the mobile phone too close to our vision, its mostly in a relax-able position and we can adjust it based on our needs. The product design is unique and it makes the operating mobile phones more convenient. The cord used around the neck looks good with a nice lining and rubber pad. I tried walking along with the phone holder and it looks like the phone remained in the same position without falling off, how cool is that? It is also compatible with all smartphones which includes high-level iPhones and Samsung s series. I can view my phone in both portrait and landscape mode. The phone holder is totally affordable, super flexible and of course fun to use. Some say that its little uncomfortable using it around the shoulder, it is mostly due to the phone weight. I am not sure whether children will find it comfortable to use due to the design and it also depends on the phone weight. It was quite shaking when I put it under the fan, later I adjusted it, but overall it is a good product and value for money.